Ole Miss asst. 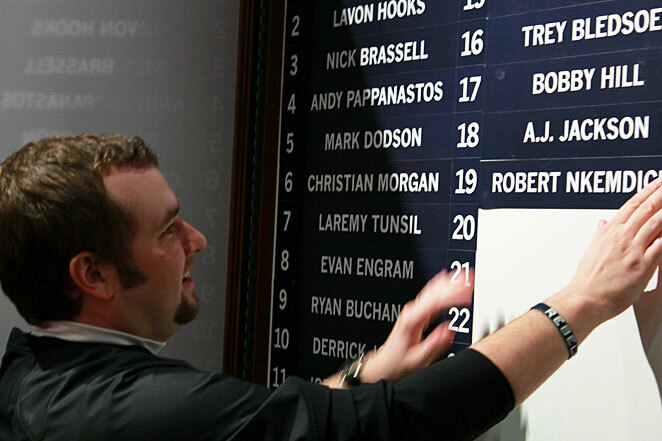 director of sports video Chris Buttgen affixes Robert Nkemdiche's name to the big board. OXFORD, Miss. -- As he sat at the great round table planted in the middle of his octagonal War Room on the eve of a shockingly successful National Signing Day, Hugh Freeze raised his hand above his eyes to indicate a level. When he gets excited or agitated, Freeze can thunder like a revival preacher at full throat. The rumors certainly had him agitated. "I'm so irritated right now, so forgive me," the Ole Miss football coach said. "I've taken it about up to here with all the media and the Twitters and everybody." Since the possibility emerged that Freeze and the Rebels might sign a recruiting haul that included Rivals.com's top-ranked receiver (Laquon Treadwell), top-ranked offensive lineman (Laremy Tunsil) and top-ranked overall player (defensive end Robert Nkemdiche), one question has nagged Freeze. Not even the question, truly, but the way everyone outside Oxford automatically fills in the answer without even considering another possibility. Freeze read the question on Twitter. He heard it posed in voicemails left by opposing coaches on the phones of recruits. He heard it from parents, who had read it on Twitter and heard it posed by opposing coaches. The outside assumption? If an SEC program that won one conference game in two years before Freeze showed up can suddenly draw some of the best players in the country, it must be cheating. Heck, when the job was open following the firing of Houston Nutt, some snarky writer applied for the job and penned a mock cover letter that suggested a coach could win consistently at Ole Miss only by shattering all of the NCAA's rules. Who was that writer? Me. On its face, it's an easy assumption to make. The Rebels, who rarely recruit outside the Deep South and who have rarely competed for the nation's top recruits unless they were sons of the school's all-time best player, suddenly were on the minds of five-stars from Florida, Georgia and Illinois. As they barreled toward National Signing Day, the Rebels were so hot that a Twitter meme developed suggesting that almost everyone of renown had committed to Ole Miss. This included Super Bowl MVP Joe Flacco, Super Bowl halftime performer Beyoncé and Freeze's personal favorite, Punxsutawney Phil. "The groundhog has emerged," Freeze said with a lilt crafted during a childhood in Independence, Miss., "and he has committed to Ole Miss." Freeze flatly denies any NCAA malfeasance. He insists he and his staff had a plan and executed it with the aid of some good fortune. In fact, it wasn't so much of a plan as an all-in recruiting gamble. If it hadn't worked -- if Nkemdiche, Tunsil, Treadwell, cornerback Tony Conner, receiver Quincy Adeboyejo and offensive tackle Austin Golson hadn't signed their names and dialed a 662 fax number on Wednesday -- Freeze and his assistants would have had to scrap everything. They would have wasted a year recruiting, and they would have overhauled their entire player-gathering operation because of it. But they didn't waste that year. The plan worked. On Wednesday, ESPN analysts talked so much about the Rebels that athletic director Ross Bjork called the day "a 12-hour commercial for Ole Miss football." Even LeBron James noticed, and when he did, Ole Miss assistants gathered around the War Room round table screamed "Retweet!" in unison. Freeze swears all those who whisper of wrongdoing are liars. "They have no clue that there's a plan -- and we have some luck," Freeze said. "I say it's God's favor, we had a really good plan, we're selling a really good vision and we have some luck." How did they do that? This, according to Freeze and his coaches, is how they did that. On National Signing Day 2012, after the Rebels' staff cobbled together a solid-if-unspectacular class in less than two months on the job, Freeze unveiled his master plan for 2013. The Rebels would identify 12 highly ranked players -- regardless of location -- and recruit them relentlessly. Most of the players were selected because of some sort of connection. One had an older brother who played at Ole Miss. One had a high school teammate who played at Ole Miss. One played at a high school where an Ole Miss staffer used to coach. One played at a high school that had an alum playing for Arkansas State, where Freeze coached in 2011. Some, such as 6-foot-6, 290-pound offensive tackle Tunsil, were selected even though the staff had no connections at the upper reaches of that position group. The Rebels needed tackles, so they figured they'd go after the best one. Freeze told his assistants that if they could get any of these players interested, they needed to be locked into an official visit on the weekend of Jan. 25, 2013. The only way to make this work, Freeze surmised, was to get the elite recruits together on the campus where they redshirt Miss Americas and make the grand pitch to the group. That way, one or two true believers might help the skeptical ones overcome any lingering doubts. The plan thrilled the coaches, who considered it a challenge. "I knew," cornerbacks coach Wes McGriff said, "I was working for an elephant hunter." Freeze originally shot into the spotlight as the high school coach of offensive tackle Michael Oher of The Blind Side fame. That experience got him a job as an assistant on Ed Orgeron's Ole Miss staff, but when Orgeron was fired following the 2007 season, Freeze faced a choice. He knew he belonged at the major college level, but he would have to prove it. So he took the head-coaching job at NAIA Lambuth, where instead of a multimillion-dollar budget he had to worry about whether he had enough helmets to practice or whether his assistants would get paid. That led to a job at San Jose State, which led to the offensive coordinator job at Arkansas State. In 2011, Freeze took over at Arkansas State, won the Sun Belt Conference title and attracted the attention of Ole Miss. Freeze's meteoric comeback had actually taken less time than his meteoric rise. Despite a run of success that instilled him with unshakable confidence, Freeze didn't simply cold-call Nkemdiche, the nation's top-ranked recruit, and convince him to come to Ole Miss. To land the nation's most sought-after player, the Rebels needed all those factors Freeze listed. They also needed to win. Ole Miss probably doesn't sign Nkemdiche, a 6-5, 260-pounder from Loganville, Ga., if Grayson High coach Mickey Conn hadn't pitched former Ole Miss offensive line coach Mike Markuson on a ball-hawking safety with a few academic issues in 2010. The player was Denzel Nkemdiche, the son of Nigerian immigrants. His father, Sunday, was a physician in Atlanta. His mother, Beverly, was a politician in Nigeria. He also had a much larger younger brother who projected to be a star. On video, the elder Nkemdiche brother was a dynamo, but he was small (5-11, 198 pounds). Other SEC programs had shied away because of his size and the strong probability that his next step after graduation would be junior college. Nutt's staff pursued Denzel anyway, and the persistence paid off. More than four months after National Signing Day 2011, Denzel learned he had made a qualifying score on the SAT. He signed scholarship papers with Ole Miss. Nutt's staff redshirted Denzel and then buried him on the depth chart at safety, so when Freeze and his staff took over in December 2011, Denzel probably wasn't the most likely person to recommend Ole Miss to his brother, who by then had become the top-ranked recruit in the class of 2013. Freeze's defensive coordinator, Dave Wommack, installed a 4-2-5 scheme that allowed safety-linebacker hybrids to shine, and Denzel, the undersized safety, became an extremely undersized linebacker. But he thrived at the position. He played his way into a leadership role rarely occupied by a redshirt freshman, leading the Rebels in tackles in 2012. Denzel's rise was only a piece of the puzzle. The Nkemdiche family told Freeze up front that he would have no chance of landing Robert if the team didn't show marked improvement. The Rebels would at least have to make a bowl game. So in November, as 5-6 Ole Miss prepared to play rival Mississippi State in the regular-season finale, the coaching staff knew what rode on the outcome of the game. Robert had decommitted from Clemson, but to have a shot against LSU and Alabama, the Rebels would have to win the Egg Bowl and earn postseason eligibility. Ole Miss came through, snapping a three-year losing streak to the Bulldogs with a 41-24 win. Fans stormed the field for a rare moment in Oxford when the party expands into Vaught-Hemingway Stadium. Among those celebrating on the field was Robert Nkemdiche, who by that time was sold on the idea of playing alongside his brother in Oxford. "Do you think I'm foolish enough to believe that we get Robert Nkemdiche if we don't have Denzel here?" Freeze said. "And if Denzel didn't have a good year?" Another post-Signing Day pickup set the wheels in motion for landing the class's Pied Piper. As they put the finishing touches on that first signing class in 2012, Ole Miss coaches realized they could use another cornerback. Cornerbacks coach "Crime Dog" McGriff watched video after video, looking for an uncommitted corner who could play in the SEC. Pickings were slim. The best players had committed long ago, and a new staff didn't stand a chance at getting into the mix so close to Signing Day. McGriff thought the Rebels might have a shot at a Crete, Ill., cornerback named Anthony Standifer, who had just decommitted from Michigan. According to Monee High assistant Torian Moore, Standifer had gotten caught in a numbers crunch, and Michigan coaches had visited him and encouraged him to re-open his recruitment. Standifer looked at Notre Dame, but the Fighting Irish weren't a viable option. He was considering Boise State, Pittsburgh and Vanderbilt when McGriff called. Moore and Standifer liked McGriff. "He didn't try to sell me on anything," Moore said. McGriff made no promise of playing time. He only promised an opportunity. A month after National Signing Day 2012, Standifer signed with Ole Miss. "Before the ink dried, Torian said, 'Hey, we've got another one,'" McGriff said. The other one was Treadwell, a 6-3, 198-pound receiver. McGriff immediately went to work on Treadwell and his mother, Tami. McGriff made calling Tami a priority because of a long-held recruiting philosophy. In the lower right corner of its basic recruit information form, Ole Miss has a section for information about that recruit's "Champion." That's the person the player trusts the most, the person who will have the most input on the college choice. Sometimes the Champion is a coach. Sometimes it's a girlfriend or a buddy. Usually, the Champion is mama. "Regardless of what anyone says," McGriff said, "a kid is never going to disappoint his mother." This would become a theme in the pursuit of the class of 2013, and it would be absolutely crucial in the pursuit of Treadwell. Moore said Treadwell favored Oklahoma, and the attraction was mutual. The Sooners began recruiting Treadwell in February 2012. But, Moore said, Oklahoma coaches didn't speak to Tami Treadwell until December. By that time, McGriff, Freeze and Ole Miss receivers coach Grant Heard had bonded with mother and son. When Tami said her son planned to take other official visits, McGriff encouraged it. He wanted Laquon to have a basis for comparison. This was a calculated gamble on McGriff's part. He knew another school might wow Treadwell with a visit, but he hoped his confidence in his own program would help deepen the trust factor with the Treadwells. McGriff also knew that Freeze would make his life miserable every moment his coveted recruit spent on another campus. "When one of our top guys goes on an official visit," McGriff said, "you don't sleep." No visit could sway Treadwell, who became the first of the five-stars to publicly commit to the Rebels on Jan. 17. But Treadwell began recruiting for Ole Miss months earlier. Among the signees, Treadwell worked the hardest to land his classmates. Treadwell spent practices for the Under Armour All-America Game proselytizing for Ole Miss, adopting Freeze's vision as his own. "The bottom line," Moore said, "is they outrecruited and outworked everybody." Moore said Ole Miss coaches did nothing unethical during Treadwell's recruitment, but Treadwell didn't help Freeze's fight against rumors of impropriety when -- shortly after an unofficial visit to Ole Miss in January -- he posted a photo on Instragram showing his hand atop several $100 bills. Treadwell quickly deleted the photo and later told the Chicago Tribune it was a joke, but the independent Internet arm of the NCAA's enforcement staff has made sure the photo will live forever on the Web and continue to cast doubt on the class's legitimacy. Treadwell had already taken his official visit during the season, but Moore made sure to bring him for an unofficial visit on the weekend of Jan. 25. Freeze had identified the date as the best chance to get the most targets together and sell them on Ole Miss. It was the first weekend after students returned for the spring semester, so Freeze knew the campus would be packed and lively. There wasn't a home basketball game to build the weekend around, but coaches wanted the visit to be all about football. Nkemdiche, Treadwell, Tunsil, Conner and Adeboyejo were there along with Rosedale, Miss., tailback Kailo Moore, Memphis, Tenn., defensive tackle Herbert Moore and several other eventual signees. Freeze wanted those players together for the final push, because peer pressure has proven a much more effective tool for influencing 17 and 18 year olds than the sales pitches of a middle-aged man. "Do you think it's just an accident that all those five-stars showed up here on the same weekend for the official visit?" Freeze said. "We worked our balls off to get them here the same weekend. That's part of the plan." On most Ole Miss official visit weekends, Freeze and the staff walk the recruits through The Grove -- America's tailgating Mecca -- on Saturday night before serving them dinner in the stadium. Word spread among the student body that so many sought-after recruits had come on the same weekend, and students packed The Grove for an impromptu party. When Freeze learned of the throng, he had to adjust the plan. The walk through The Grove was off. "There were so many people in the Grove that I had to cancel it," Freeze said. "It would have been a violation." Indeed. Had Freeze walked the players through The Grove, opposing coaches almost certainly would have used social media accounts of the event to turn the Rebels in to the SEC or NCAA for a violation of the NCAA's rules against gameday simulations. That weekend, Freeze brought in his top targets into the War Room and gave his most powerful pitch. The revival preacher needed converts, and he had them inside his tent. "Let's do something new and fresh. ... Why can't you guys go beat Alabama?" Freeze remembered saying. "The difference is they have better players. But if we get you guys, that could change." Nkemdiche and Treadwell already believed. Tunsil, to whom the staff had zero connection before last year, was almost prepared to join the flock. The NCAA allows 14 staff members from each school to write letters to recruits. Ole Miss had 14 staffers writing letters to Tunsil and four people close to him. Defensive line coach Chris Kiffin, the son of Monte and younger brother of Lane, built relationships with Tunsil and his girlfriend. Kiffin estimates he exchanged more than 800 Facebook messages with Tunsil and more than 400 with Tunsil's girlfriend. To land Tunsil, Ole Miss needed a full-court press. The top tackle hails from Lake City, Fla. Gainesville is 40 miles south. Tallahassee is 100 miles west. Meanwhile, SEC powers Alabama and Georgia also wanted to land a jumbo athlete who had Freeze mouthing the letters N-F-L as he watched video of Tunsil in pass protection drills. The onslaught worked. Tunsil committed to Freeze during an in-home visit in late January. But Tunsil kept that commitment a secret. Besides, the Rebels knew Alabama and Georgia wouldn't give up their pursuit until Tunsil's National Letter of Intent rolled off the fax machine. Ole Miss coaches watch as heralded defensive end Robert Nkemdiche announces his college destination. 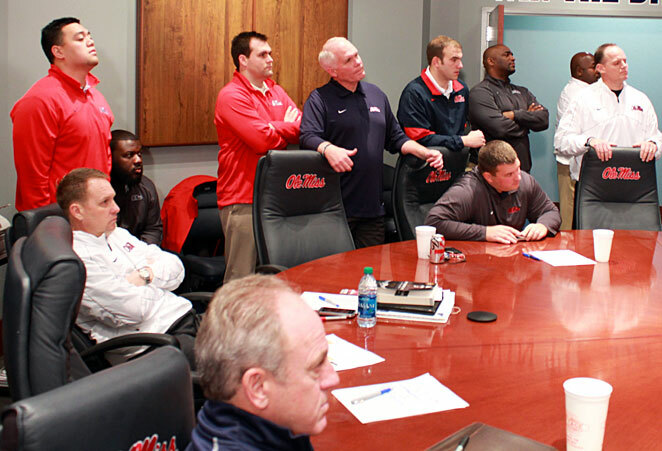 At 5:30 a.m. CT on Wednesday, the Ole Miss staff sat at the round table in the War Room. The first conversation had nothing to do with recruiting. Freeze read a passage from a book by Tony Dungy about love and relationships. The passage referred to a verse in First Corinthians, and for five minutes, staffers discussed their definitions of love. Next, Freeze went around the table seeking prayer requests. Finally, the coaches and staffers bowed their heads and prayed. They did not ask God for anyone's signature. After they said Amen, Freeze ran down the list of committed players and targets. Prospects are allowed to send their signed National Letters of Intent to schools beginning at 7 a.m. on National Signing Day. Because Oxford is in the Central Time Zone, NLIs from players in the Eastern Time Zone can arrive beginning at 6 a.m. The previous night, Avon, Ind., defensive end Elijah Daniel, an Ole Miss commit, had told Freeze he intended to sign with Auburn. Freeze scratched him off the list. Almost everyone else seemed firm. Nkemdiche and Treadwell had given coaches detailed timetables for their Signing Day festivities. Tunsil's commitment seemed firm, but the quality of the schools still chasing him kept coaches from relaxing. At 5:44 a.m., Freeze asked Kiffin when he could expect Tunsil's NLI. "Sixteen minutes," Kiffin said. The coaches seemed sure of almost everyone, but a few questions lingered. They believed Conner, the star cornerback from nearby Batesville, Miss., would spurn two-time defending national champ Alabama to stay in his home state. "Solid as they get," director of high school relations Barney Farrar said in his Kossuth, Miss., drawl. "Like 24-karat gold." Staffers identified only two real question marks. Chris Jones, a defensive end from Houston, Miss., who had committed to Mississippi State the previous June, had loved his time in Oxford. Jones was originally rated a three-star prospect, but after impressive showings at all-star games in December and January, Rivals.com elevated him to a five-star. Other schools jumped in for Jones, including Ole Miss. After word leaked that Jones would consider Ole Miss, he became one of the most controversial figures in the state. Reporters tracked his movements between the campuses in real time. Fans ripped him on social media. In an interview with ESPN.com recruiting reporter Kipp Adams, Jones said he had received death threats. During their attempts to flip him, Ole Miss coaches had won over Jones and his father. His mother remained steadfastly in Mississippi State's camp. The other question mark was Austin Golson, an offensive tackle from Prattville, Ala. Golson had previously committed to Florida State, and he had kept the lines of communication open with Seminoles offensive line coach Rick Trickett. Golson would announce his destination at 8 a.m. CT. Ole Miss offensive line coach Matt Luke thought Golson would pick the Rebels, but he couldn't be sure. "He turned his phone off," Luke said. Coaches around the room exchanged knowing glances. After the rundown, Freeze looked at graduate assistant Kane Wommack, the son of Dave Wommack. "Hey Moneyball," Freeze yelled. The younger Wommack, who had been tagged with the nickname because of his propensity for this particular duty, then ran down where the Rebels stood in all the major recruiting rankings. He then projected, Nate Silver-style, where they would finish based on the Rebels' own inside information and research into which schools prospects would choose in down-to-the-wire recruitments that didn't involve Ole Miss. Not long after the digital clock above the door flipped to 6:00, Kiffin re-entered the room clutching several sheets of paper. He dropped them triumphantly on the table, and the coaches jumped from their seats and cheered. True to his word, Tunsil had faxed his NLI at the first moment he was allowed. The Rebels had landed the nation's top-ranked offensive lineman, and they had taken him from the backyard of a powerful conference rival. Freeze initially had doubts when he saw University of Florida wallpaper at Tunsil's house. Those doubts deepened during the recruiting process when Freeze saw photos of Tunsil in Georgia gear. "Florida wallpaper," Freeze said. "Georgia shirts." Then operations director John Miller interrupted his boss. "Ole Miss paperwork," Miller said, and they all cheered again. With Tunsil's paperwork in hand, the coaches had to do a bit of acting. Tunsil was scheduled to announce his choice at 9:30 a.m. ET on ESPNU. ESPN had a camera and a reporter in the building. Assistant director of sports video coordinator Chris Buttgen placed a magnet bearing Tunsil's name on the signee board just below the six junior college transfers and early enrollees who had already arrived on campus for the spring semester, but then Buttgen shut the cabinet that held the board before the ESPN crew entered the War Room to film the coaches watching Nkemdiche's announcement. Ole Miss coaches didn't want to steal the thunder of Tunsil's live announcement, so they would have to pretend they didn't know Tunsil's choice until after he announced. This made for some interesting viewing in the War Room as ESPN analysts discussed the class in their studio. Shortly before Nkemdiche's announcement at 7:35 ET at his school in the Atlanta exurbs, the analysts pondered how Nkemdiche's choice might affect Tunsil. When Nkemdiche announced he would attend "the University of Ole Miss," the coaches leaped from their chairs to celebrate again. They had known for months that they probably would land the nation's top-ranked recruit, but until Nkemdiche mashed up the University of Mississippi with the nickname by which everyone knows it, they had refused to completely believe. Now they could. The gambit had worked. They would not, as Freeze had warned earlier, have to "go the other route and start finding those hidden-gem three-stars" for future classes. Athletic director Bjork had watched the Nkemdiche announcement with his coaches. Shortly after, he stood to leave. "Time to go raise some money," Bjork said. "We just made your job easier," Farrar quipped. Shortly after he razzed his boss, Farrar looked at his iPhone, his jaw agape. Freeze had forwarded him a text from Conner, the solid-gold commitment from Batesville. "I love you, coach. But I can't do it. Tell Barney." Freeze looked puzzled. The room turned tense. Then running backs coach Derrick Nix burst out laughing. Conner had suggested the Signing Day practical joke, and Nix had agreed and helped him craft the text. With his ruse, Conner had joined a distinguished club. Treadwell (with help from Heard) had fooled Freeze with a similar text earlier in his recruitment. Tunsil (with help from Kiffin) had done the same. But with a text minutes before Conner was supposed to sign, Conner and Nix took the prize for most devastating joke. "Coach Freeze got frozen," Nix said, admiring his handiwork. Freeze did receive an actual piece of bad news on Wednesday morning. Amid the euphoria over the historic class, Jones informed coaches he intended to honor his commitment to Mississippi State. Freeze entered the War Room shaking his head. "Chris Jones?" Freeze said. "Mom's going to win that deal." Once again, Wes McGriff's prophecy proved true. In most recruitments, mama is the Champion. Not long after Nkemdiche announced, Buttgen wired up the War Room to watch a Web stream of Golson's announcement from the library at his high school. As Golson's teammates announced their choices, Luke looked sick to his stomach. In watching the feed, he thought he had identified Golson's grandmother wearing garnet. Florida State's colors are garnet and gold. Luke looked on helplessly as Golson took his seat, said his thank-yous and announced his choice. When the 6-6, 285 pounder chose Ole Miss, Luke got mobbed by his fellow assistants, who lined up for hugs. "Hey, Matt," Dave Wommack said. "The color is red -- not garnet." Luke smiled. "It looked garnet to me," he said. The ESPN crew re-entered the room at 8:25 CT to film the coaches watching Tunsil's announcement. They found a celebration, but it wasn't for Tunsil. Conner had just signed and sent in his paperwork, but no one told the crew. Conner's announcement wouldn't be for another 95 minutes, so the coaches kept that one a secret as well. On the televisions, ESPN recruiting analyst Derek Tyson reported live from Columbia High in Lake City. He reported that Tunsil had come to school early and sent in his paperwork to the winning school, but Tyson said Alabama and Georgia appeared the teams to beat. That got a big laugh in the War Room. When Tunsil announced for Ole Miss, the ESPN producer in the War Room signaled for a live shot. The coaches jumped and cheered and backslapped as if their lives depended on it. They seemed to enjoy acting as if they were celebrating as much as they enjoyed actually celebrating. When Ole Miss makes its Daytime Emmy submission, the envelope will carry a DVD of that celebration. By the time the fax machine went silent, the Rebels had closed a class of 27 players. (SEC rules allow only 25 signees between February and May, but the Rebels counted their six early enrollees against last year's total. They signed 21 on Wednesday.) ESPN had broadcast what amounted to an all-day infomercial for Ole Miss. The Rebels were trending on Twitter, and they were set to finish in the top 10 in the team rankings of all four major recruiting services. Freeze's bold plan had come to fruition, and his coaches believed that if they could do it once, they could do it again. The whispers will linger, just as they do every time Alabama, Auburn, LSU, Georgia or any other SEC school signs a top recruiting class. The NCAA and SEC will almost certainly get tips of alleged wrongdoing by coaches and boosters at all those schools. If Freeze wants to continue operating in this stratosphere, he'll have to get used to that. And Freeze intends to keep hunting elephants. He and his staff have already identified most of the dozen national recruits they'll pursue for the class of 2014. On National Signing Day, dozens of envelopes containing handwritten notes by all 14 staffers allowed to write notes sat in stacks, waiting to get mailed to the players Freeze and the Rebels hope will be the next in a long line of stellar Ole Miss recruiting classes.